Attacks on Black communities are intensifying, but across the country and in the Philadelphia area, organizers are responding with strength and power. “Working in social service, I felt like people were given things, but not what they needed to be sustainable to take hold of their own power,” says Patrice Green, a Bread & Roses donor. Youth Art & Self-empowerment Project (YASP) was founded in 2004 by young people who wanted to build a movement to end the practice of automatically charging young people as adults and incarcerating them in adult facilities. 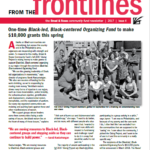 Racial & Economic Justice Fund grantee Put People First! PA successfully pressured the Pennsylvania Insurance Department to hold nine town halls across the state for people to speak directly with decision makers about rate increases and quality of care.